THE MAYBELLINE STORY : Maybelline founder's nephew takes family on wild ride after inheriting millions at 45. Maybelline founder's nephew takes family on wild ride after inheriting millions at 45. ﻿﻿Maybelline Story Author Sharrie Williams with her father, Bill Williams, at his estate in Palm Spring California, during the filming of the movie Goodbye Norma Jean, in 1975. Read more about Tom Lyle's nephew Bill Williams in the Maybelline Story, and the wild ride he took his family on after the sale of the Maybelline Co. sold in 1968. It could be said that all hell broke lose after Bill inherited millions overnight at only 45, but in the end I'd have to say "it sure was a fun ride." 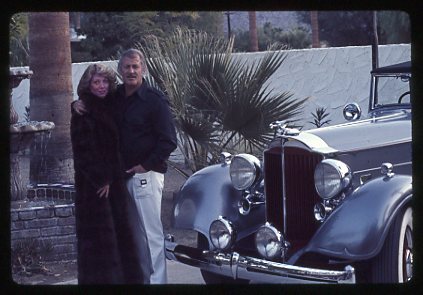 Also stay tuned for Sharrie's cousin Chuck Williams as he discusses his great uncle Tom Lyle Williams love of beautiful automobiles while at the Barrett Jackson Classic Car Auction in Scottsdale next week.